October 26, 2013, Jacksonville, Fla.--We're home. This trip we put 906 miles on Junior. 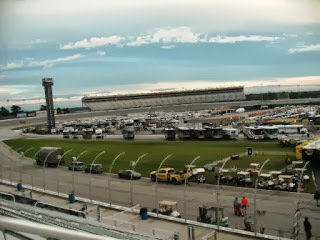 We traveled up to Atlanta, across Georgia to Augusta, across South Carolina to Charleston, and then back home to Jacksonville. We saw beautiful rolling countryside, antebellum mansions and plantations, and the Beach Boys. We drank Coca Cola soft drinks from around the world, ate Gullah cuisine, and mastered Atlanta's mass transit system. This trip we didn't drive on any levees, get stuck in sand dunes, or follow bad coordinates around an oxbow lake. We did learn that we could dry camp for a week on 100 gallons of water, our solar panels, and our generator. We also learned that we didn't miss TV too much. We did not take our satellite system, and the antenna failed to pick up many TV stations. Good books make good traveling companions. Our only real "excitement" resulted from two electrical electrical problems. One was a faulty GFI breaker in Junior; the other was a faulty breaker at the last RV park in South Carolina. These problems took away from our tourist time and were troubling for a while, but as usual, my husband was able to figure out what was wrong and fixed it. Our cats even became good travelers. Although Xena left unwanted "gifts" three times outside of the litter box, she and Charlie got along pretty well. They didn't hide; they found comfortable places to sleep while we traveled. Charlie even sat in my lap most of the time while we were driving. We had a good trip. Even though we didn't go far, we saw a lot. We are even thinking about Georgia or South Carolina as possible places where we might relocate to. Time will tell on that issue. All that said, I'm glad to be home. It is a beautiful evening here. Our little lake is still as a mirror, reflecting the setting sun. I've topped off the swim/spa and turned up the heat, so tomorrow I'll take a swim. And then I'll get ready to take my next trip--to Chicago. I leave Wednesday. The trip won't be as comfortable (I'm going by air), but I'll be seeing grandkids, and that will make up for the couple hours of discomfort in the cattle-car environment of the airplane. October 25, 2013, Charleston, S.C.--Charleston, S.C., has been on my list of places to visit. Now I can say I have been there. In some ways, Charleston reminded me of New Orleans, with its grand old homes, riverfront views, narrow streets, its history, and its traffic. Yes, traffic. For a city that isn’t really that big, Charleston has a real traffic problem. 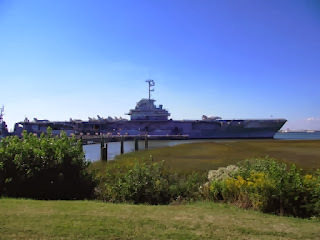 Yesterday, while Jim was trying to solve another electrical problem (it turned out to be the RV park’s problem, not ours), I went into Charleston on my own. 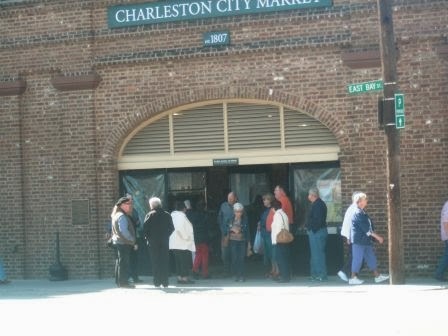 The day before, we had driven into the historic downtown area and gathered brochures at the Visitors Center, where we discovered that the city offers three free trolley car rides to tourists (as well as to residents). I intended to park in one of the public lots somewhere along one of the main streets (Meeting St. or King St.) and catch a trolley for an unguided tour. 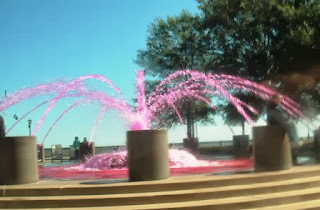 The fountain in Battery Park was dyed pink in honor of breast cancer awareness. I drove around for at least 30 minutes (maybe longer), looking for a place to park. Every lot was full. My dilemma reminded me of the last time I had gone into New Orleans before moving back to Indiana: I had wanted to take some final pictures, and drove into the city. Unfortunately, I could not find a parking place, so I gave up and went back home. I never did take any pictures of landmarks in New Orleans. I didn’t give up so easily yesterday. Instead, I drove back to the Visitors Center and parked there. I caught the Green Line Trolley and rode it around until it arrived at Market St. I wandered the four blocks of open-air market buildings, which have stood there since 1807, bought some excellent pralines for dessert, and then re-caught the trolley and headed home. The open-air market extends for four blocks and has stood in the same place since it was opened in 1807. 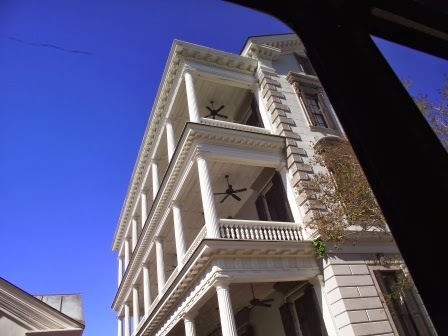 The old mansions in Charleston are quaint and beautiful. We noticed that many of the mansions face inward. We later learned that they were built with their front porches either facing west or south to catch the best sun as well as the sea breezes. A mansion whose front porches face inward rather to the street. Jim and I are not “into” mansions and plantations, so we did not take a city tour. 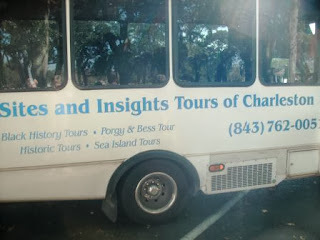 Instead, we took a Gullah Geechee Culture Tour. Gullah (also known as Geechee) is a culture and a language spoken by the slaves who were brought to the area from Africa. This invented language is a hodgepodge of English and African languages. It is still spoken by some Gullah peoples who live on the barrier islands in South Carolina and Georgia, but it is a dying language and culture. Our tour guide took us around the city and two of the barrier islands and explained slavery and the Gullah culture in Charleston. It was a very informative two and a half hours. Slave quarters on one of the barrier island plantations. A cemetery for blacks. 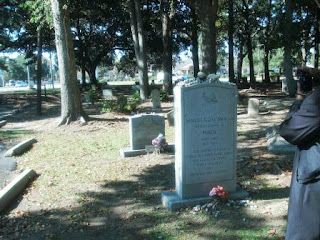 This tombstone is for Porgy, upon whom the opera Porgy and Bess was based. His mother's tombstone is behind his. The cemetery began as a slave cemetery. However, slaves did not have tombstones. 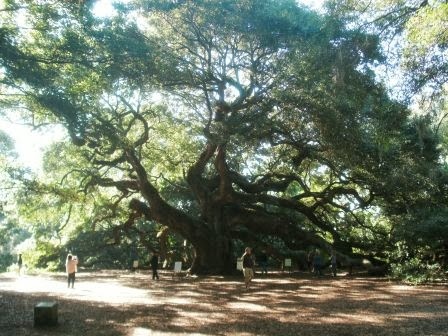 The 1400-year-old Angel oak, which stands on land that was part of Abraham Waight's 1717 land grant. The tree is really probably about 400 years old. 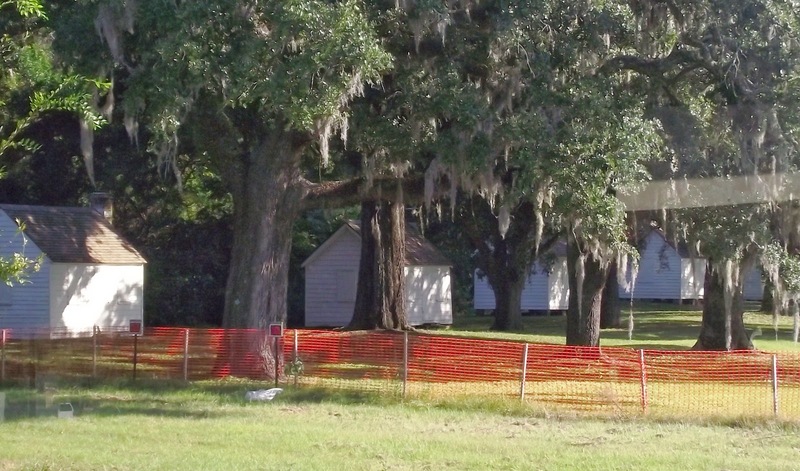 Legend has it that ghosts of slaves dance around the tree. After the tour finished, we found a Gullah restaurant the guide recommended. I had a Gullah specialty of rice, sausage, chicken, and shrimp. I would liken it to jambalaya, although the spices were different and it was not tomato-based. Jim had a seafood bisque with Gullah red rice (a spicy rice; Gullahs eat rice with all their meals). The lunch was typical low-country and excellent. With lunch under our belts, we found Patriot’s Point, a park and sports complex area that is home to the USS Yorktown (a WWII aircraft carrier). 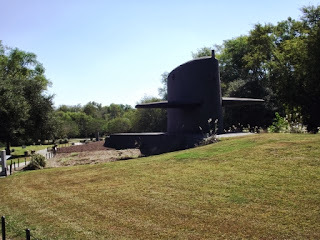 We also found a memorial to South Carolinian submariners--a replica of a submarine with the sail (conning tower) and the rudder from two different boats. Charleston has a lot of museums and is a repository of history. It is where the Civil War began, with the attack on Fort Sumter. If I were to come back, I think I would want to visit some of these museums. But for now, we passed on them. Tomorrow we head on home. It has been a good trip. October 22, 2013, Augusta, Ga.--I’ve written Augusta, Ga., as my dateline, but in reality we are across the Savannah River in a small town called Beech Island, S.C. We found this RV park through Passport America, a membership group that gets us a 50% discount on RV park stays. I have to tell you, this has been the friendliest stay we’ve ever had. Usually when you pull into an RV park, the first thing you do is check in at the office, give your name and perhaps some other information, and pay up front. This is a small park, developed on someone’s home site many years ago. The owner lives on site. He met us as we pulled up and guided us to a spot to park our rig. After we got settled in, we had a nice conversation. I actually brought up payment! It was only $20--for two nights. Mind you, this is for full hookups: electric, water, and sewer. Jim asked our host what there was to do around here. (We are five miles from Augusta, Ga., across the river.) We also asked about a good South Carolina barbecue place. He said he’d check out a couple of things and get back to us. A couple hours later, the host knocked on our door. 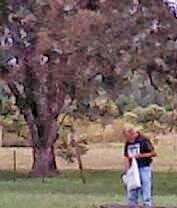 He handed Jim a bag of pecans (complimentary; he also has black walnuts for the asking), as well as several brochures his wife downloaded. This was very helpful. And how thoughtful! Our first destination was just down the road from our RV park. It was the Redcliffe Plantation State Historic Site. Unfortunately for us, the plantation house was not open for tours today. However, the park ranger gave us a very informative talk as she pointed out a number of artifacts housed in the visitor center. 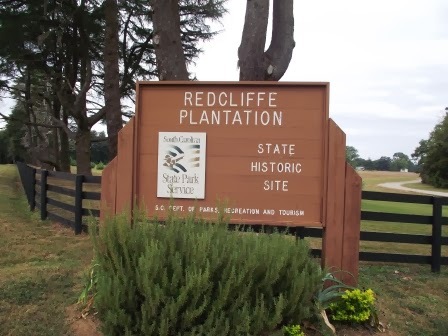 The Redcliffe Plantation was built by James Henry Hammond, who had been a senator and governor of South Carolina. He was not an admirable man. He was someone who micromanaged everyone around him--and abused them. However, he kept meticulous records, and from his written records, a great deal is known about how slaves lived, ate, and were treated. He actually had written a job description for his slave overseers! Our next stop was lunch. We found downtown Augusta, and drove down Broad Street where most of the retail stores and restaurants seem to be located (aside from shopping centers, of course). We ate at a Mexican restaurant where we shared a large plate of delicious nachos. 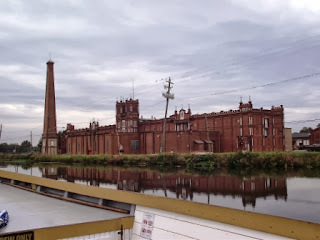 Our next tourist destination was the Augusta Canal, the only industrial canal still in use in the United States. 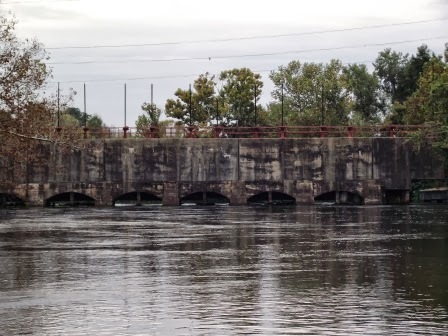 Built in 1845, it harnesses the water of the Savannah River and powered the mills, which were built as the canal was finished. The canal is clean. Augusta’s drinking water comes from it. Along its banks is a wildlife refuge area. People kayak and canoe and fish along the 82 mile canal. 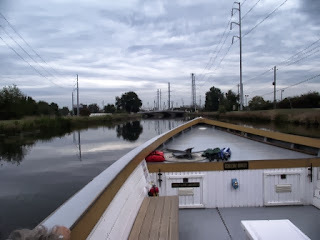 We took an informative hour-long boat tour down the canal. For the price of a boat ride, we also were able to browse through the canal’s museum. 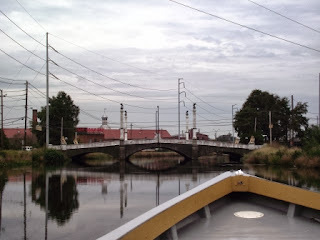 Down the Augusta Canal in a Petersburg boat replica. This type of boat carried goods (mostly cotton) and people down the canal to the Savannah River. A now-closed mill. Today, because of the canal, it still generates $400K income, through electric power generation. 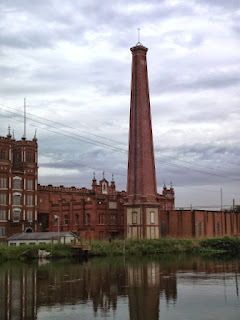 The smokestack of the Confederate Armory. This is all that remains of the armory, where all munitions were manufactured for the rebel troops. The only lock on the canal. The oldest bridge in Augusta, designed after bridges in Venice, Italy. 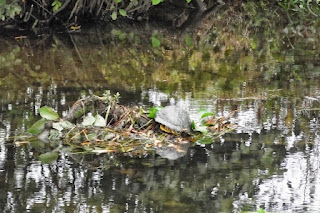 Wildlife (turtle) sunning in the canal. We also saw a river otter. After the boat tour, we drove around a bit, just taking in Augusta. I looked on our GPS for other attractions and found one that said “Creighton Living History Park.” Curious, we decided to check it out. 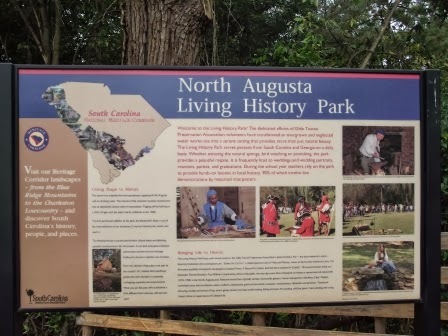 It was located in North Augusta, S.C., just across the river from Augusta. This park had a number of original buildings, which apparently are manned by re-enactors at specific times. I’m sure the park is used as a learning tool by teachers and enjoyed by students. The old buildings were not open, but the park was open to stroll through. It was charming and peaceful, with its bubbling spring that ran throughout the area. Electricity is not a problem. We have some solar panels, so on a sunny day, we can keep our house batteries pretty well charged and don't have to run the generator to make coffee or use the microwave. We run the generator when we watch TV, but that's about the only time. Water (fresh and waste) is another issue. Short navy showers (get wet, lather up, rinse off) are a must. Paper plates are highly recommended. Some people trek down to public showers to clean up, but I'd rather not do that. I've even seen people walking out to the port-o-potties to avoid filling their own black (waste) tanks. We've done well. One more night here, but we have not had to call for the "honey wagon" to dump, nor the fresh water wagon to refill our potable water. I don't like the combo washer-dryer unit we have in this RV; I much prefer the stacked washer-dryer (just like those found frequently in apartments). The stacked unit allowed for bigger loads and was faster. However, the combo unit is what we have. Unfortunately, it can take about 1.5 hours to wash and dry a very small load of clothes. Instead of doing laundry once a week, as I do at home, using the combo requires doing a small load each night. However, when you are dry camping, you cannot use your washer-dryer. The water would be gone in a jiffy, and the holding tank would fill up quickly. After a week of camping, our clothes hamper was overfilled. So, this morning I found a laundromat. The cost of using a laundromat's washer's has increased considerably over the years. It is no longer 50 or 75 cents. The big front loader (I put in two loads) cost $5.50. The small front loader (one load) was $3.75. (This laundry did not have top-loading machines.) Drying cost an additional $1.50 for all loads. That's $10.75 to wash and dry the equivalent of three loads of clothes! Oh, well. The laundromat was just down the road; it was relatively clean; and now we have enough clean clothes to finish out our trip. However, if we stay in a campground with full hookups, I'll be doing small loads each night. Have you ever gone to a home show? Jim and I usually go to both spring and fall home shows put on in Jacksonville. It's fun to walk around and see new merchandise. It's also a good time to talk with venders about products we might be in the market for in the near future. RV shows are home shows for a very mobile audience. The venders at RV shows specialize in items that are unique to recreational vehicles, and believe me, you could go broke if you gave into impulse buying. But, like home shows, RV shows are good places to gather information for future purchases. Sometimes you get really good bargains, too. Yesterday, we purchased one of those bargains--Good Sam travel benefits and assistance. For a discounted price of $79 for one year, I bought peace of mind, should an emergency occur while we are away from home. The travel plan is actually a specialized insurance program. If either of us had a medical emergency, the plan would take care of getting us home. It would also take care of the cost of getting the RV home--plus other benefits and assistance, such as finding a doctor or vet. Two years ago this type of travel benefit was included in the membership for FMCA (Family Motor Coach Association). However, FMCA dropped the benefit as part of its membership package and started selling it separately, just as Good Sam does. The $79 is a small price to pay for peace of mind. As we wander through the vender buildings, Jim is gathering information on such things as stabilizer bars, batteries, LED light systems, replacement awning fabric, and water pumps. Who knows if we will buy any of these things? In the meantime, we look and lust after all the aftermarket products available to moneyed RVers. And we sign up for drawings and get free samples of products that "guaranteed to change our life." 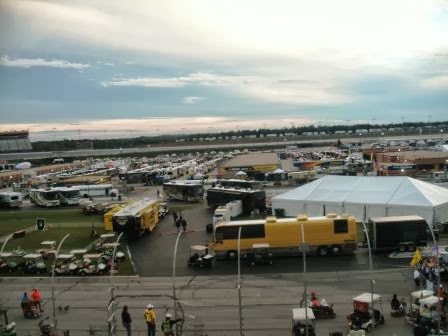 When we arrived here on Tuesday afternoon, there were several hundred RVs parked in various lots around the Atlanta Motor Speedway. Now, there are thousands--I would guess between 8,000 and 10,000. We have spent the last couple of days sitting in various educational seminars on successful RVing. Jim is most interested in better understanding motorhome electrical systems and waste systems. I learned more about using that miracle invention Velcro in RVs. Because we've been at this for going on three years now, I didn't learn too many new tricks, but I did hear a couple of innovative ways to use Velcro. It really is a lifesaver in an RV. We are now able to run our generator without "breaking" the rules. Jim completed the exhaust stack last night, and it works great! The cats are basically behaving themselves. Xena was naughty once, but not since then. Oh, yes. Last night she jumped off the couch to go get a snack out of the dry food bowl. After a few bites, she went back to napping. A few minutes later I got up from my computer and discovered that she had deliberately tipped the food bowl over, spilling the bits all over the floor! I don't know what got into her; she's never done that before. The Rally has a lot of social activities, for those who are bent on socializing. (I am not.) As part of the cost of admission (which, for us, was free), everyone is invited to three concerts. Tonight, it was the Beach Boys, which still has one of the original members, Mike Love. Neither of us was ever a fan of this music group, but we felt that we "had" to go. So we did, for about a half hour. 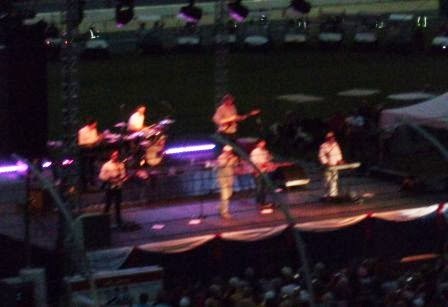 I never went to a Beach Boys concert when I was young. Now I can say I did as an oldster. Tomorrow the concert is Vince Gill. I am told he is a country music star. We will probably go to the concert, but I doubt that we will stay very long. Hampton, Ga.--You've probably used the phrase "out in the boondocks." To RVers, the boondocks can be a very real thing. We are boondocking--that is, dry camping. We've done this before, usually for only one night staying at a Walmart or rest stop, while enroute to a destination. We tried boondocking for a longer period of time when we went to Quartzite, Az., two years ago. We lasted, I think, three or four days. Dry camping is just that: no hookups for water, electricity, or sewer. Everything is self-contained. It is roughing it, albeit with all the comforts of home (hot water, toilet, television, computer, gas stove, etc.). Those comforts come with a cost, however. The cost is the use of coveted resources of water, electricity, and waste-water tank capacity. Our solar panels have been a big help. (You remember those solar panels...the ones Jim was installing when we fell off the roof and broke eight ribs, his clavicle, scapula, left hand, and left foot?) The solar panels help keep our house batteries charged, so we can use electricity. However, the more you use, the more you drain the batteries. If the sun isn't shining (or we need more power), we have to run the generator. That burns fuel, of course, but it gives us electricity to do anything we want, just as if we were plugged into a receptacle. The generator is another issue. Because of the close proximity of the parked RVs, we are required to put an extension on the generator exhaust pipe, to pull the carbon monoxide fumes away from the RVs. Ever resourceful, Jim did not want to pay $150 for a kit that was comprised of a bent pipe, a couple of clamps, and some PVC. So he's making his own extension kit for a fraction of the cost. He'll have it done later this afternoon. However, because we aren't "legal" we've limited using our generator, out of consideration of others around us. Water is another issue. So far, so good. To conserve water, we take "Navy" showers: wet down, lather up, rinse off. We use disposable plates as much as possible. We try not to run water except when absolutely necessary. What happens if our grey and black water tanks fill up or we run out of water? Not to fear; the Rally has provided a "honey" wagon (which pumps sewage) and a water truck. All for a fee, of course. So far, however, we are doing well. We'll see if we can last the week. I used to take the train to work, when I worked in Chicago and lived in Wilmette, a northern suburb. I loved the no-nonsense commute. I would also occasionally take the El into downtown Chicago. That required being a little more adventuresome, since it required transferring trains, but I learned to do it, and I discovered that I didn't have to put up with the cost and trouble of finding parking in the city. When Jim suggested taking MARTA (which I think stands for Metropolitan Atlanta Regional Transportation Authority), I was hesitant: We didn't know how to use the system. However, since we learned to do it in Washington, D.C., we figured we could do it in Atlanta. 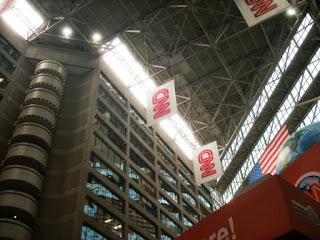 As a side note: The RV Rally sponsors several area tours, including one that takes in CNN headquarters and the World of Coca Cola, which is next door to the Georgia Aquarium. The cost of the tour was close to $70 a person. Jim and I decided to go on our own. Our cost: $24 each for the combo tour tickets ($48), plus the cost of MARTA transportation--$12. We spent half as much as the cost of the bus tour. We had no problem with the train, which dropped us virtually at the doorstep of CNN. We only had to wait a few minutes for a tour. In addition to us, there was a father and son, so this was a pretty private tour. Being on the tour let me fulfill a lifelong dream: to read the news on air! Well, sort of. CNN has a mock-up studio as a first stop on the tour. After the guide explained how the teleprompters worked, as well as some other technical details of putting on the news, he invited one of us to try reading the news. It was my chance. Unfortunately, it didn't occur to my husband to take a picture(: He said I looked nice on TV, though. A view as we were going up the eight-story escalator. 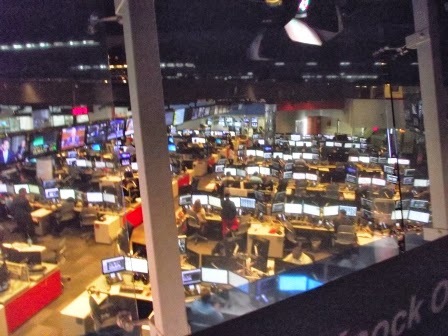 The CNN tour was really very interesting. If I were young, I think I would like to work in broadcasting. Broadcasting, though, is a young person's job, since its constant deadlines are very trying. After CNN we trekked across Centennial Park to the World of Coca Cola. It, too, was interesting, despite its being pure marketing. It was fun to sit through the 4D movie as well as to watch a collage of international commercials. 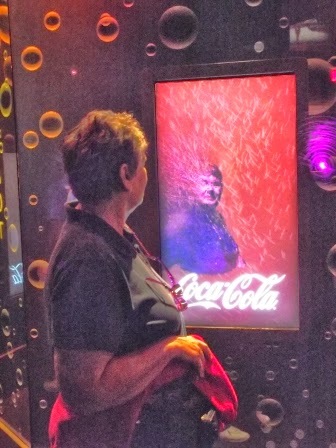 The best part, however, was being able to taste more than 60 coke-brand flavors from throughout the world. Many of the flavors were similar to ones we have here; some, however, were absolutely horrible. 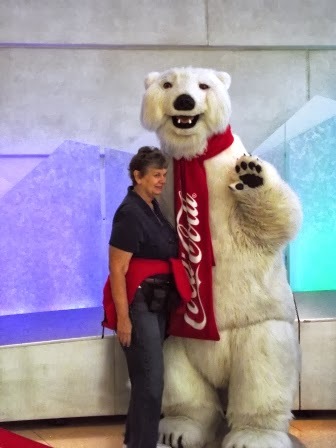 We hadn't eaten anything all day, so after the Coke tour, despite being filled up with soda, we were going to look for a place to eat. Jim wanted to go to Atlanta Underground; I have never been there, but several people who know the area told us to be "careful" of that area of the city. We stopped to ask directions from a police office. His advice? Don't go there. He said that it wasn't like it was 20 years ago, when Jim had been there. Now it was unsavory and mostly only flea-market stalls, with no good restaurants. We decided to pass. The police officer recommending a hike up to the Varsity, a hot-dog/hamburger restaurant near Georgia Tech. It was quite a hike for foot-weary trekkers, but we made it. Jim said the Varsity is often shown on football games. I never heard of it. No matter; we didn't eat there. They did not have gluten-free buns, and eating a hot dog without a bun wasn't appealing. We decided to head home. By this time, my feet were really aching. I looked around and mused, "I think there must be a MARTA stop near here." As I pulled out my smart phone to try to find out, Jim stopped a passer-by, who pointed to the MARTA station a half block away. Yea! We didn't have to walk back downtown. Lunch? Well, it turned into dinner. When we got off MARTA at our station, we caught a whiff of barbecue. As we drove off, we found the restaurant and sated our appetite. It was good barbecue. Tomorrow the Rally actually starts. We'll be going to seminars and visiting venders. Should be fun. What is not so much fun is rationing water and electricity, since we are dry-camping. More about that later. I never thought much about Georgia, until I moved to northern Florida. For much of my life, I equated Georgia with Atlanta. Of course, I knew the state had much more than that metropolis, since I have traveled through it on several occasions. But on this trip, I seem to be really seeing Georgia for the first time. 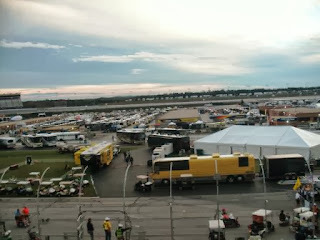 We spent a couple of days in an RV park in Unadilla, a small farming town about 30 miles from Macon. For those of you who are geographically challenged about Georgia as I have been, Macon sits just about in the middle of the state. After we solved our electrical problems, Jim and I decided to play tourist in Macon. That wasn't a hard decision; there really wasn't much else to do around Unadilla. We had already gone to Americus where we could have visited the world headquarters of Habitat for Humanity (had we not been eager to fix our electrical problems). And we had already visited Andersonville, which was a prisoner of war camp that had horrible living conditions. (If you haven't read the novel Andersonville, I recommend it.) So, Macon was just about the only other area to visit. I'm glad we did. We really liked the city with its antebellum grandeur. In some ways, Jacksonville and Macon are similar. I think Jacksonville is slightly older; both have city-county governments; and both are located on rivers, which had an impact on their development and growth. Jacksonville is much larger (864,000), vs. 155,000. Macon, however, seems vibrant and living. 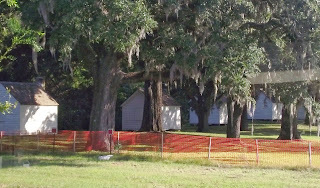 Maybe it is because the antebellum homes are kept up (at least on the outside). Most of the big, old homes were closed for touring because we were there on a Monday, but we were able to tour the Hay House, a National Historic Landmark. The countryside in central Georgia is beautiful. Pecan trees are everywhere. I told Jim I wanted to stop and buy some pecans. We didn't have to! The RV park in Unadilla was nestled among pecan trees. Last night we picked up several pounds of the nuts. Yum! 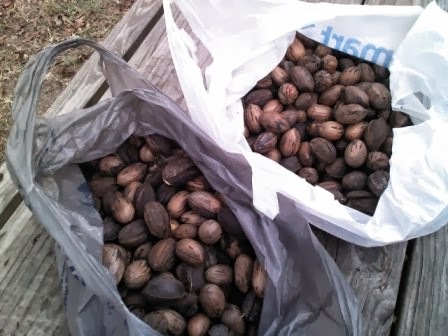 Jim and I picked up a couple bags of pecans fallen from the trees. These goodies were just lying about, waiting for us to pick them up! 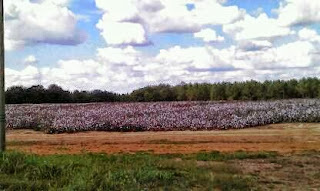 A cotton field ready to be picked. 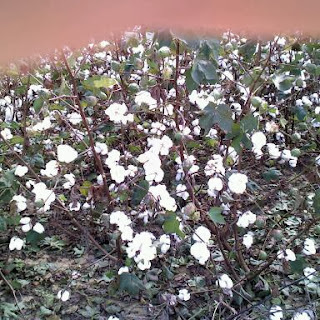 Here's a cotton bush up close. I took home a ball for a memento of our trip. We will be driving northeast across Georgia next week, in order to go to Raleigh. As we make our journey, we'll see more of these lovely countryside. In the meantime, we are not discounting the possibility of the Macon area for relocation. Just an idea right now. We need to do a lot of research about cost of living, including housing and real estate taxes. We're not in any hurry. We can come back and have an extended visit and "try out" living wherever our curiosity takes us. 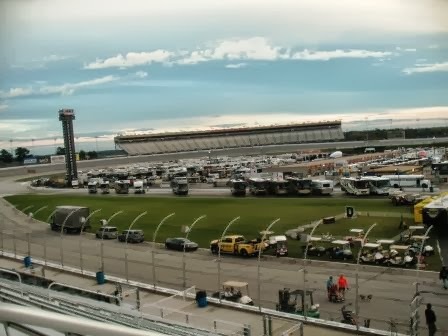 Unadilla, Ga., October 13, 2013—I’ve written about electrical woes before. They seem to be the bane of RVers, at least to us. Last time we took a trip (a month ago, to south Florida), we had no electricity for one evening. At first we thought the problem lay with the hookup at the state park where we were staying. The park ranger checked everything out, however, and informed us that unfortunately, the cause of the problem was in our motorhome. We had no power all night. The next morning Jim, the Sherlock Holmes of electrical systems, finally found the cause of the outage: a ground-fault breaker. A simple fix; he just had to reset the breaker and we were back in the power business. Last night, all was good. Everything was working well. Then, all of us sudden, around midnight, while Jim was watching TV, the power went off. In a motorhome, you aren’t quite in the dark if the power goes off, as long as you have fully charged house batteries, which we do, thanks to the solar panels Jim installed. Nevertheless, we had to figure out what was causing the outage. It was late, so we slept on the problem. In the morning, Jim tested the GFI and discovered that it was not functioning properly. In all likelihood that was the source of the problem. Getting a new GFI was a challenge, though. Unadilla is slightly more than a wide spot in the road. We asked “Garmina” (our GPS) the location of the nearest hardware store. Okay...not too bad. Unfortunately, the hardware store was also located in a very small town, and it was not open on Sunday. We asked Garmina again for suggestions. This time we opted to travel farther and opted to go to a Lowe’s, in Americus, Ga., another 20 miles away. Americus is a quaint town, home to Habitat for Humanity. I think we actually went through this town last year when we visited Andersonville, the Civil War prison site. After buying the GFI and driving around the town a bit, we queried my smart phone for a Mexican restaurant for lunch. We found one, El Jalapeño. Nestled in a neighborhood nowhere near any other commercial establishments, this restaurant drew a huge after-church crowd. And no wonder. The food was cheap and terrific! Back to the power problem. It is apparently solved (cross fingers), thanks to Jim. He changed the GFI, and now we seem to be back in business. We are hoping for no new surprises for the rest of our trip—as well as for future trips as well. We didn’t get to “tourist” much today. Tomorrow we will find out what there is to do around here. Perhaps tour Macon? Who knows. The Georgia countryside is beautiful, and it is nice just being out of the house. Unadilla, Ga., October 13, 2013—Both cats are traveling with us on this trip. Good thing, since we’ll be gone about two weeks, a wee bit long to have one (or both) of them left alone at home. We didn’t have any problems getting them on board, mainly because we got smarter. As soon as I got us yesterday morning, I spied both of the felines sleeping on the porch. I then casually went outside and locked the outside cat door. That accomplished, I did the same to the inside cat door. As long as we didn’t let them in the house, the cats had no place to hide. Junior is stored north of us, so instead of driving the RV home to load it, we began our loading Friday by packing virtually all our clothes. With Charlie and Xena safely captured on the porch, Jim and I loaded the car. With everything else stowed, we tackled the cats. Jim took Xena (no problem). But then Charlie decided something was up and started running away from us. He had no place to hide, but it took a few minutes for us to corral him anyway. Finally, we had them both in animal crates, and we were off. So far, so good. So far, no unwelcome “gifts” from Xena (although I anticipate this will change at some point, unfortunately, since she has a way of getting back at us for restricting her freedom). They traveled well, even coming out to see what was going on as we rambled down the road. Oh...one more thing. When we came home earlier this evening, Charlie was sleeping in the lounge area, but Xena was nowhere in sight. I finally found her: In one of my underbed drawers! She had crawled under the bed and found a way to hide in the drawer. Never under estimate the power of a cat.